In our last press brake tooling post, we introduced you to our hemming tools with knurled edges that help create classic hem folds such as the flattened hem and the teardrop hem. This post explores another hemming tool option – Mate Spring Loaded Hemming Tools. Spring Loaded Hemming Tools from Mate feature a durable spring inside the body of the tool that enables the die to perform two functions. First, the top of the die has an acute V opening which is used to make the acute bend in the flat sheet. Make sure that the punch you select has the same angle as the V opening, in this example, 30°. Note that each hemming die is rated for a maximum material thickness. In this case 1.5mm (0.059”). After producing the acute bend, the sheet is re-oriented to a flat and level position in front of the brake so that it can be introduced to the open gap in the hemming die where the planishing process is to take place. This is the space identified as 15mm with “100 Open 95 Closed” in the attached drawing. The brake can be cycled now to create the hem. Note that in this cycle, the material thickness is doubled since it is being folded onto itself. Pay attention to increases in tonnage. The Mate Spring Loaded Hemming tool can work with any punch that has the same angle as the angle of the V opening and that has a small radius nose. Chances are that you have punches in your factory now that can be used. Naturally, if you looking for a matching punch for this application, we are able to help you identify the right tool for the right job. As Mate continues to be your One Source for sheet metal fabricating solutions, we are proud to offer five different variations of the spring loaded hemming tools. 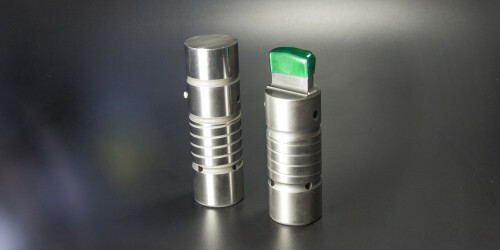 The dies range in maximum material thicknesses of 1mm (0.039”) to 3mm (0.118”) and feature 26°, 30°, and 35° angle options. And if you’re in need of a short flange 90° bend, we have the hemming tool option to help you get out of the way during operation. We’re not reinventing the hemming die wheel, but we are providing more options for our customers to meet their needs. Whether you’re punching, bending or cutting, Mate is the One Source when it comes to purchasing the tooling you need. If you would like to learn more about our Spring Loaded Hemming Tools, please contact us with any questions you have.